China launched a spacecraft Wednesday to replenish the country’s fleet of meteorological satellites providing warnings of weather fronts and tropical cyclones across Asia. The Fengyun 2G satellite lifted off at 0102 GMT Wednesday (8:02 p.m. EST Thursday) from the Xichang space center in southwestern China’s Sichuan province, according to the China Meteorological Administration. The spacecraft flew into orbit aboard a Long March 3A rocket, a 172-foot-tall launcher with three stages. The Fengyun 2G satellite deployed from the rocket’s hydrogen-fueled third stage about 24 minutes after liftoff. The state-run Xinhua news agency and a CMA press release called the launch a success. The mission was aiming to put the 3,000-pound weather satellite into an egg-shaped transfer orbit. The spacecraft’s own propulsion system will put Fengyun 2G into a circular geostationary orbit 22,300 miles over the equator. Fengyun 2G’s launch ensures continuous weather observations over China and neighboring regions, Chinese officials said. Once it is declared operational, the new satellite will take over for the Fengyun 2E weather observatory at 105 degrees east longitude. Fengyun 2E — launched in December 2008 — will drift to a new location at 86.5 degrees east to replace the aging Fengyun 2D satellite, which has been in space since December 2006, according to a presentation by officials from China’s National Satellite Meteorological Center. China’s fleet of Fengyun 2 spacecraft have a similar mission to NOAA’s GOES weather satellites in geostationary orbit. They provide non-stop images of clouds and storm systems over a third of the planet from the Middle East to the Central Pacific Ocean. Chinese meteorologists exchange weather data acquired by the Fengyun satellites with NOAA and Eumetsat, its European counterpart. Made by China Aerospace Science and Technology Corp., Fengyun 2G is expected to operate at least four years, but previous Chinese weather satellites have functioned longer than designed. The new satellite features several technical improvements, and officials expect it to work until 2020, the China Meteorological Administration said on its website. The barrel-shaped satellite is spin-stabilized — rotating at 100 rpm — and carries a scanning radiometer to observe Earth’s weather in visible and infrared wavelengths, allowing day and night imagery of storms. Its imaging instrument will take pictures of Earth every hour in most scenarios, but the updates will come every 30 minutes in some cases, such as China’s flooding season from June through August each year. Fengyun 2G can take observations of localized severe weather systems as rapidly as every six minutes in quick scan mode, according to CMA’s website. A space environment monitor aboard Fengyun 2G will detect solar X-rays and high-energy particles to support space weather forecasting. 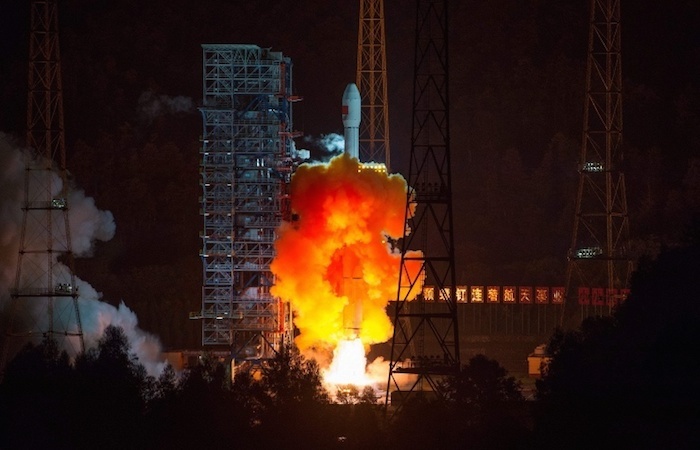 China has four geostationary weather satellites in operation after the launch of Fengyun 2G. Authorities removed the Fengyun 2C satellite from China’s weather fleet in early December, CMA said in a press release. The country has a fleet of polar-orbiting weather satellites working in concert with the Fengyun 2 spacecraft. China put its first weather satellite into geostationary orbit in 1997, three years after an explosion killed a worker and destroyed the first Fengyun 2 satellite in a fueling hall at the Xichang launch base. The last Fengyun 2-series weather satellite is scheduled for launch in 2017. China is developing the next-generation Fengyun 4 meteorological satellite system to replace the Fengyun 2 fleet, with the first of the new series of spacecraft due for liftoff in 2016, according to CMA.